there's a hole in my bucket. Whilst MDF isn’t as freely available as it once was, and there are more levels of justification to go through, which may or may not be a box ticking exercise, there is a still a lack of focus on delivering ROI against the original investment. Campaigns are often unmeasured, leads are regularly untracked and therefore wither and die and the expected ROI doesn’t happen. Sound familiar? 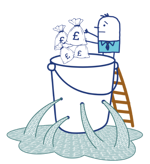 Read our Leaky bucket article here.